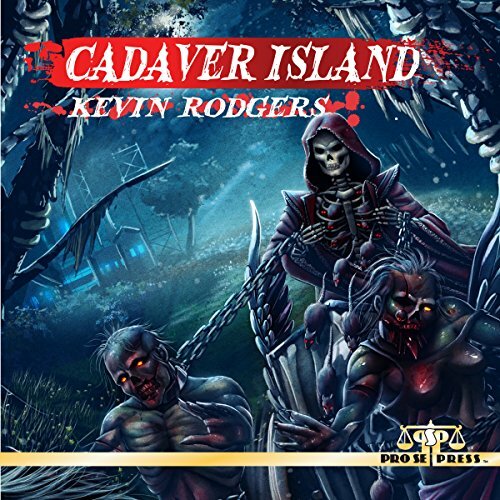 Pro Se Productions Proudly Presents CADAVER ISLAND, the debut novel from Author Kevin Rodgers, now available as a top quality audiobook produced by Radio Archives. In the year 2212, long after the world has been reshaped by seismic cataclysms and polar shifts, Princess Angelique Bosc recovers from a terrible Hovercraft accident, which left her injured and near death. Her friend and physician, Dr. Laurent Stine, used his skills as a robotics engineer to replace her damaged organs with android components. Angelique realizes that her mechanical heart will require a fresh battery pack within 48 hours. However, a loathed and exiled warlock, Xavier Thames, steals all of the battery packs and transports them to his castle, Thames Keep, in order to build a time machine. Angelique, Dr. Stine, and their allies are forced to embark on a long, perilous journey to Thames Keep located on Cadaver Island. Can they reach Thames Keep and replace Angelique's battery pack before she goes into cardiac arrest? Cadaver Island is the first installment of a trilogy by Author Kevin Rodgers, who introduces readers to a fractured, ruined world where forgotten, legendary creatures live and thrive in towering mountains, magical forests, and barren deserts. Angelique Bosc and her allies will traverse harsh, nightmarish landscapes to discover the secrets of the past, stabilize events in the present day, and unlock the mysteries of the future. Cadaver Island is a mind blowing futuristic horror thriller guaranteed to chill and amaze! From Pro Se Productions, a leader in Genre and New Pulp Fiction! This groundbreaking New Pulp audio book is also available on Audible and Itunes. CADAVER ISLAND is available at Amazon and www.prose-press.com. THE GUNSMITH #413: DEMON’S CURSE NOW AVAILABLE!